PG | for mild rude humor. The long awaited sequel Cloudy with a Chance of Meatball 2 sees Flint and friends and family return to Swallow Falls to shut down Flint's invention that survived the first movie. The "Flint Lockwood Diatonic Super Mutating Dynamic Food Replicator" or FLDSMDRF for short has turned the island into an living island of food with cheespiders, tacodile supremes, mosquitoasts and such roaming around. Flint is sent by his idol in science, Chester V head of Live Corp to shut it down. But this Steve Jobs parody figure is more than meets the eye. 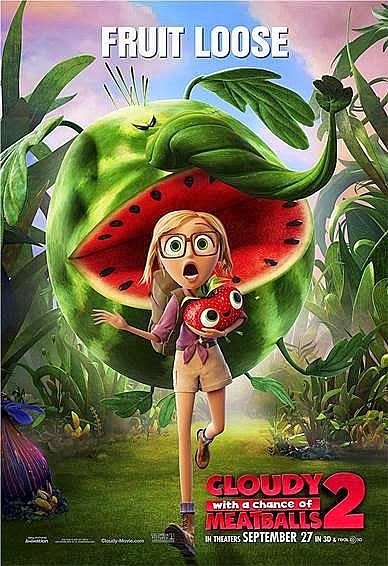 With a very Jurassic Park feel to the movie, albeit with much cuter creatures, the sequel doesn't differ much as far as animation quality and laughter formula from the first movie. Many of the familiar characters return, as the movie continues exactly where the last one left off. Mr. T. however is replaced by Terry Crews as Officer Earl Deveraux. Chester V played by Will Forte and Barb, a talking orangutan played by Kristen Schaal rounds out the new additions to the cast. Like the first movie, the story is quite predictable as to what will happen and the laughs are periodically sprinkled throughout. Most of the jokes are play on words like "there's a leek in the boat!" Some of the scenes are just awkward to watch. Like when the father is singing with the pickles while fishing. Sorry, I just don't get it! Overall, this is a must see if you're a fan of the first or if you have young children. If you're neither, it still have enough good going for it to make a nice date movie or a morning matinee. A third book is in the works currently, so perhaps we'll get a trilogy. As far as animations goes there are much worst this year, but the franchise thus far has consistently settled for slightly above mediocrity. 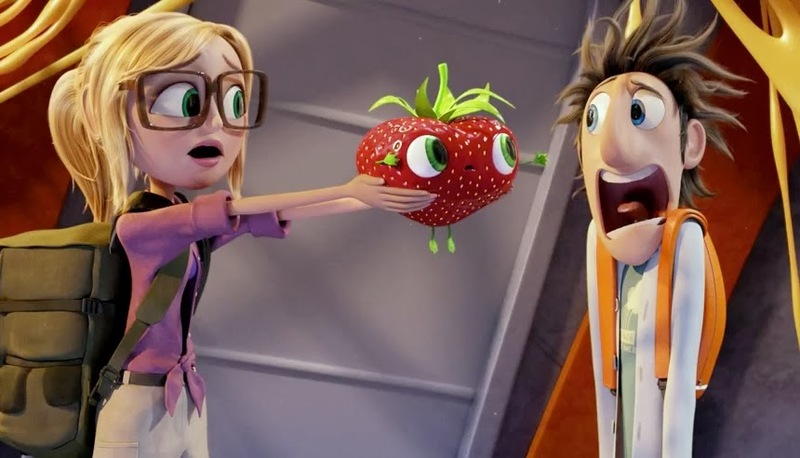 Bill Hader as Flint Lockwood, an inventor. Anna Faris as Samantha "Sam" Sparks, a weather intern from New York City and Flint's love interest. James Caan as Tim Lockwood, Flint's widowed father. Andy Samberg as Brent McHale, an infamous/former celebrity mascot of Baby Brent's Sardines, now known as Chicken Brent. Benjamin Bratt as Manny, Sam's Guatemalan cameraman and a former doctor, co-pilot, and comedian. Terry Crews as Officer Earl Devereaux, the town's athletic cop. 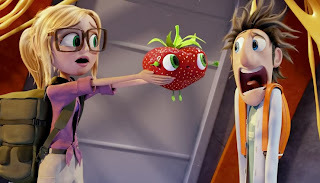 Will Forte as Chester V, a world-famous super-inventor and the head of the Live Corp.
Kristen Schaal as Barb, Chester V's talking and lipstick wearing orangutan with a human brain.